For years the perception has existed that, while most companies have the desire to focus on more sustainable products or processes, they do not necessarily have the economic or commercial wherewithal to implement such programs. For innovators and budding entrepreneurs, an additional challenge lies in obtaining funding for an innovation where the investor’s ROI may take longer to realize than an investment in—say—a tech project. But a recent report prepared by Trucost for the American Sustainable Business Council and Green Chemistry & Commerce Council shows that safer chemistry, (defined as reducing the use and generation of hazardous substances, reducing the human health and environmental impact of processes and products and creating safer products) is not only increasing in market growth and demand, but also makes better business and economic sense than most people think. The report prepared by Trucost revealed that both in the private and public sectors there has been an increasing demand for safer chemistry and products with a number of companies (including retail companies such as Walmart) requiring vendor disclosure of priority chemicals. What does that mean? It means that if you want to do business with the big guys—you’d better prove that you are thinking “sustainable”. Kaiser Permanente reveal that they require medical product vendors that bid on national contracts to complete a Supplier Sustainability Scorecard about ingredients, internal chemicals policies and social/environmental products. It’s not just about providing a quality product any more—it’s about providing a quality SUSTAINABLE product. Market growth has also been substantial, with the global market for “green chemistry” projected to grow from $11 billion in 2015 to nearly $100 billion by 2020. In the US alone, the projected growth over the same period is expected to increase from $3 billion to over $20 billion. Certain market sectors in particular are projecting a spectacular growth rate: the building material sector anticipates a growth rate of over 2000% between 2009-2030 while the chemistry sector anticipates a growth of over 3200% between 2011-2020. The growth rates for the conventional market over the same period are estimated at 176% and 133% respectively. Large companies are also seeing growth in their safer products with Sigma-Aldrich going from 0% “Greener Alternative” product sales in 2010 to 14% in 2013 and Dow going from 1.7% sales of products “Highly Advantaged By Sustainable Chemistry” in 2007 to 10% in 2013. While the demand and supply for products based on safer chemistry continues to grow (the US Patent & Trademark Office has also witnessed an increase in patents based on sustainable chemistry), the investment in these same products is still in its infancy. 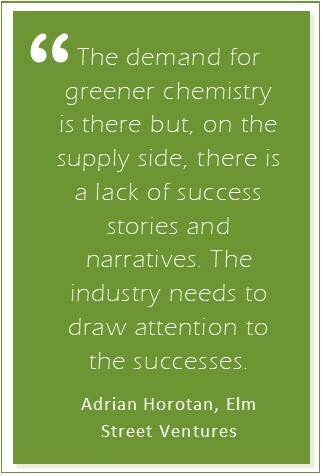 Although the report is limited on the reasons for the lower capital flow despite the increase in demand, one of the reasons given is summarized by a quotation from Adrian Horotan at Elm Street Ventures: “The demand for greener chemistry is there but, on the supply side, there is a lack of success stories and narratives. The industry needs to draw attention to the successes.” The industry should accept this challenge. in particular for products in the personal care/cosmetics, health care, apparel and retail sectors, as well as products containing flame retardants. In addition, companies need to consider state, federal and EU/REACH regulations many of which differ in terms of stringency. and safety but also to reduce the variability and risk associated with the regulatory landscape. In this particular arena, proactivity is ultimately the most cost-effective choice in the long run. Regardless of size, it is critical that companies consider not only the cost but also the risk to their brand and reputation resulting from any fines arising from the mishandling of hazardous chemicals. Between 2005-2010 one health care vendor lost a $70 million contract because it could not provide PVC/DEHP-free medical products. Between 2008-2010 one multi-national company lost 8.4% of their market share due to customer concern about their ingredients. In 2013, $17 million was spent by companies on tort settlements for violating California Prop 65. One company in Charleston, WV, filed Chapter 11 bankruptcy, settled a $2.9 million class-action lawsuit and pled guilty to federal crimes for toxic spill and water contamination when in 2014, a leaking storage tank belonging to the company was found polluting the Elk River with 4-methylcyclohexane methanol, used to process coal. These are just a few examples. In today’s hyper-connected world, a company’s brand and reputation is more important than ever and companies must consider the potential impact to business value such negative events could bring. The report clearly shows that market growth and demand are on the increase while at the same time large institutional, governmental and retail buyers have declared their intent to adopt policies to buy/source greener products. Furthermore, the number of companies that are able to demonstrate increased business value and growth due to an adoption of sustainable or green principles is also growing (Dow, DuPont, Sigma-Aldrich, Method) which bodes well for future investments in this type of technology. Reduction in costs related to workplace safety and materials management. Avoidance of a reactionary approach to the constantly evolving lists of restricted substances mandated by state/federal governments and corporate customers. Demonstration of company’s human health & environmental leadership, innovative design, long term vision. became the norm for all businesses. Click HERE to read the complete report on the American Sustainable Business Council website.